A few weeks ago, I decided to take the day before Christmas Eve off from work to take a break before the kids came over to stay on Christmas Eve. A few days ago, I realized that with my busy upcoming holiday schedule that I might not have enough time to see all the movies I "need" to say over the holiday break. As my quest to see all 10 future Best Picture nominees continues, I planned to do the unthinkable today. Walk five minutes from my apartment (which I couldn't be happier with by the way) over to the AMC Hoffman Theater at 10:15 AM to see back-to-back-to-back movies. A few times in my life I have double dipped and saw two big screen movies in one day. I have never gone beyond that though and I decided to attempt the feat today, seeing True Grit, The Fighter and Black Swan in one sitting. The plan of attack went PERFECTLY. I missed the first two previews during The Fighter as I needed to get a pizza and giant Coke Zero. I had a nice 15 minute break before Black Swan to hit the bathroom and order a follow-on snack of chicken tenders (and another "small" soda). 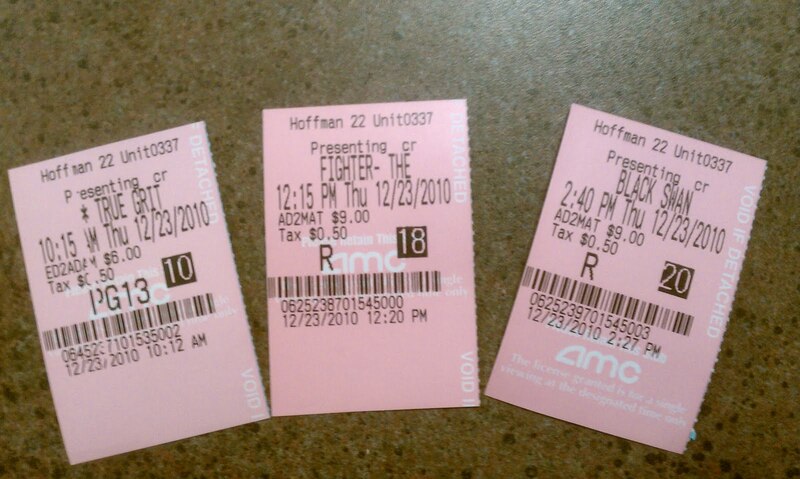 The theaters were semi-crowded (mostly with AARP members) but overall it could not have gone any better. I actually felt like a legitimate film critic (one that doesn't get paid however.... hmmm.... do I know of anyone like that?). In all of the movies I sat in the exact same row (that weird handicapped row where there are isolated groups of two seats with a lot of leg room). The most amazing aspect of the marathon was that I did not once start to doze off in any movie. I attribute my alertness to the giant sodas filled with caffeine I downed. I was shocked that I never felt tired. I started getting a bit sleepy in Tron Legacy amidst all the dark neon visual hypnotics on the screen. And yes, I WAS tempted to just buy one ticket and theater hop for the rest of the day but I felt compelled to contribute to the box office for these three films. Overall, a total of $24 for three films isn't all that bad. Now the tough part. Writing three reviews tonight. I am going to churn these out right now in order of viewing. I feel that I will be very far along in the process once the Academy announces the Oscar Nominations next month. And all I can think of is attempting a 4-movie marathon next holiday season (I honestly would have been able to make ANOTHER movie at 5 PM today).